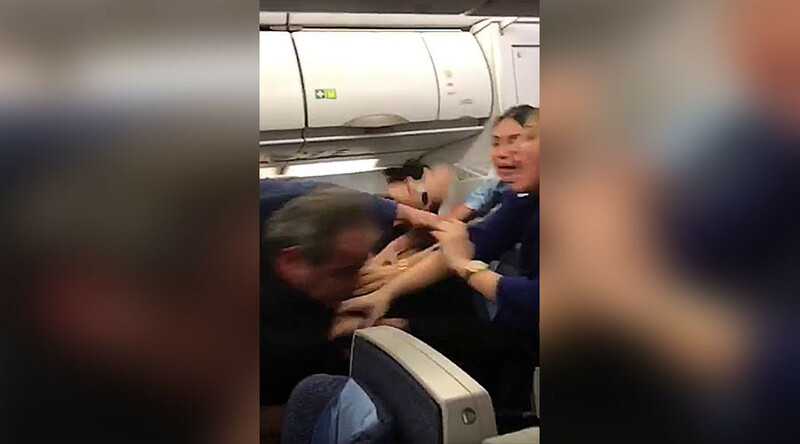 A passenger on a flight from Beirut to London recorded a fight that broke out on a Middle Eastern Airlines flight after a passenger got into an argument with a flight attendant and began assaulting her. A flight from Beirut to London was forced to make an emergency landing after a brawl broke out on board at 35,000ft. Footage taken by a passenger aboard the Middle Eastern Airlines flight shows two men squaring up before launching into a punch-up. The older man can be seen throwing the initial blow, with the younger man then retaliating by smacking him repeatedly in the head. The pilot was forced to make an unscheduled stop in Istanbul, Turkey, after chaos broke out.Mobile phone footage shows the two men facing off in the aisle surrounded by a group of passengers.